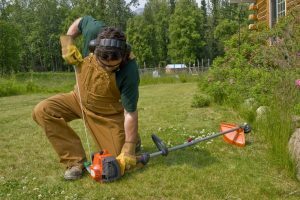 There are two major types of weed eaters which include electric weed eaters and gas-powered trimmers. 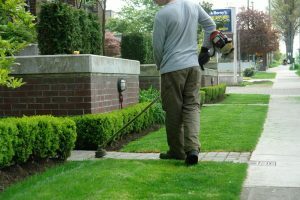 While electric trimmers rely on electric power through a power cord connected to the machine and a power outlet, gas-powered models rely on the combustion between gasoline and oil. Due to their small sizes, weed eaters take advantage of the 2-cycle engines which are also common in motorcycles, and other small generators and machines. To maintain an effective engine performance, users are required to mix lubricating oil to the fuel system to promote continues lubrication of the engine and its moving parts. The 2-stroke engine requires a precise gas/oil mixture for efficient operation. Too little oil in the gasoline will cause engine parts to seize due to insufficient lubrication, while too much oil in the fuel will cause problems in combustion. When mixing gas and oil, it’s important to understand that all trimmers powered by 2-stroke engines use the same gas/oil ration of 40:1. This translates to 3.2 ounce of oil to 1 gallon of regular gasoline. The oil should not contain over 10% alcohol and must be the best quality meant for 2-stroke engines. Avoid using automobile oils as they contain non-combustible components which may damage your engine. Note that different manufacturers use different gas/oil ratios. For instance, Echo weed eaters run on a 50:1 ratio which is equivalent to 2.6 ounce to 1 gallon of gasoline. The best thing about these machines is that the ratio of oil/gas is mostly stamped on the engine or printed in the owner’s manual in case you need clarification. With that in mind, it’s important that you ensure that the gas and oil is mixed in the correct ratio to avoid too much smoke buildup, lack of power, and overheating/damaging of your machine’s engine. With a clean 1-gallon gasoline can, pour the correct amount of oil and one gallon of fuel; then swish them thoroughly to ensure complete mixture of the two. The reason why it’s advisable to use a gallon instead of directly mixing the gas and oil in the trimmer’s gas tank is to avoid recording any wrong measurements which can damage your machine. Only use small amounts of fuel which will last you a month. This is because modern fuels contain additives which are likely to break down if they sit for too long. The mixing ratio of gas to oil differs from trimmer to trimmer. Different companies manufacture different models which come with different engine capacities. Depending with the type of oil used, the ratios mostly range from 25:1, 30:1, 40:1 to 50:1. 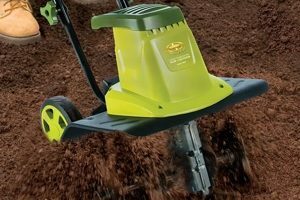 Mostly, the ratios are indicated on the trimmer’s engine or in the user’s manual. In case you don’t find the mix ratio printed anywhere, start with the smallest ratio and progress to the highest till you find the correct mix ratio which will work best for your weed eater. Regardless of the size, most companies have developed the trend of manufacturing high speed engines which run fast. With speeds of up to 10,000 RPM, these engines run hot due to friction inside the pistons. To reduce impact caused by high operating speeds, it’s advisable to use higher grade automotive fuels for your weed eater. 90-octane and above is the recommended fuel which will ensure that your machine performs as expected. Regular-grade unleaded fuel is the recommended gasoline for a 2-stroke weed trimmer’s engine. With an octane rating of 90 and above, this fuel is capable of preventing knocking and damaging of your trimmer’s engine. Oils defer depending on the type of engine. For instance, 2-cycle engines require 2-cycle oils, while 4-cycle engines require 4-cycle oils. These oils are designed to function depending on the number of pistons found in every engine model. When buying oils, there are two types of oils you’re likely to find—synthetic oils and regular oils. While regular oils are cheap to purchase, synthetic oils are quite expensive, but their lubricity means that you’ll end up using less. These oils are not meant to save you the cost of buying; they’re simply designed to increase the lubricity of the pistons to prolong the life and performance of your weed eater’s engine. Most weed eater manufacturers have warned users against mixing fuels with more than 10% alcohol. This is because too much alcohol in the gasoline can easily damage the system and fuel lines. Most weed eater manufacturers also warn users against using unmixed gasoline/oil. If the two are not thoroughly mixed, there will be insufficient lubrication which can cause friction and damage to your trimmer’s engine. Also, avoid using marine oil designed for automobiles. These oils are designed to be used by liquid-cooled, but not air-cooled engines like those of trimmers. Such oils are dangerous and can leave harmful carbon deposits in the cylinder or muffler. Before you start mixing your oil and fuel, it’s a good idea to first consult the manual. This is because some weed eater models use varying gas/oil ratios ranging from 30:1, 40:1 and 50:1 mixtures. Use the recommended oil to avoid damaging your engine. After you’ve mixed the gas and oil in one container, let the mixture stand for about 30 minutes before mixing it thoroughly. Remember to mix a small amount which will last you for 30 days. This is to avoid separation of oil after sitting for too long. Use the 2-stroke motor oil as it’s lighter and more combustible than 4-stroke motor oil. When cleaning your machine, remember to clean the air filter, muffler and the fuel filter in case of any weeds or grass. Be careful when cleaning to avoid any grass debris from falling into the fuel tank and contaminating the oil. With that in mind, your weed eater should be ever ready to perform without experiencing any engine or fuel-related problems.